Life Calendar. Your life story. On a gorgeous poster. Important! It looks like you are located outside the United States. International shipping is our highest priority, but currently, we ship only to the United States. Please subscribe to our mailing list, and we'll update you when we are ready! We use Stripe for accepting payments. Stripe is certified as a PCI Level 1 Service Provider - this is the most stringent level of certification available in the payments industry. We don't store your Credit Card details during or after the checkout. We are still working on the mobile version. To create your Life Calendar please use your laptop or desktop computer. The mobile functionality is coming very soon! 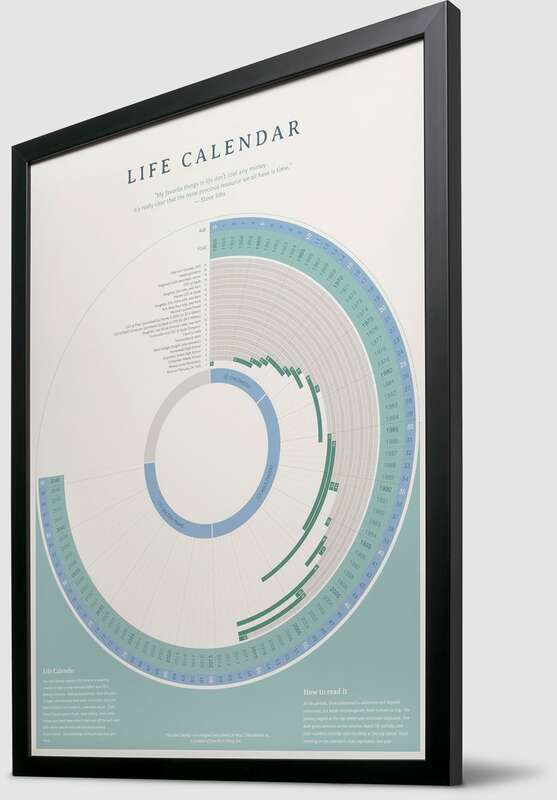 Life Calendar depicts every important period of your life on a stunning timeline. Your studies. Your wedding day. The birth of your child. The first time you traveled abroad. Each moment earns a special place on a personalized work of art. Life gets busy. Often, we are too distracted to step back and appreciate the stories that brought us to where we are today. Life Calendar is a beautiful reminder of what defines us. Reminisce about the loved ones who’ve impacted your experience. Explore important moments that intersected. Be amazed at just how full the journey’s been thus far. Think about the future too. How do you envision yourself at 60? 80? Creating your Life Calendar is easy and exciting with stunning design and intuitive editor. Just list the dates of any significant period of your life. And the editor will lay them out perfectly. Take your time to consider what to include. A big part of the Life Calendar experience is reflecting upon all those fleeting moments that brought you here today. When the poster arrives at your home, give it the best spot to be appreciated by all those you love. Observing life’s moments from this unique vantage point helps you reframe the stories that define who you are. It’s the perfect family keepsake and motivational work of art for the office. Work of art. Museum quality. Vividly displaying your life story, Life Calendar is printed on high-quality, smooth matte paper with a light, fine-grain surface texture. Precise colors and crisp lines look stunning in any surroundings. The superior printing process with great finish creates a work of art as beautiful as the stories it represents. Elegant frame. Matches any surface. 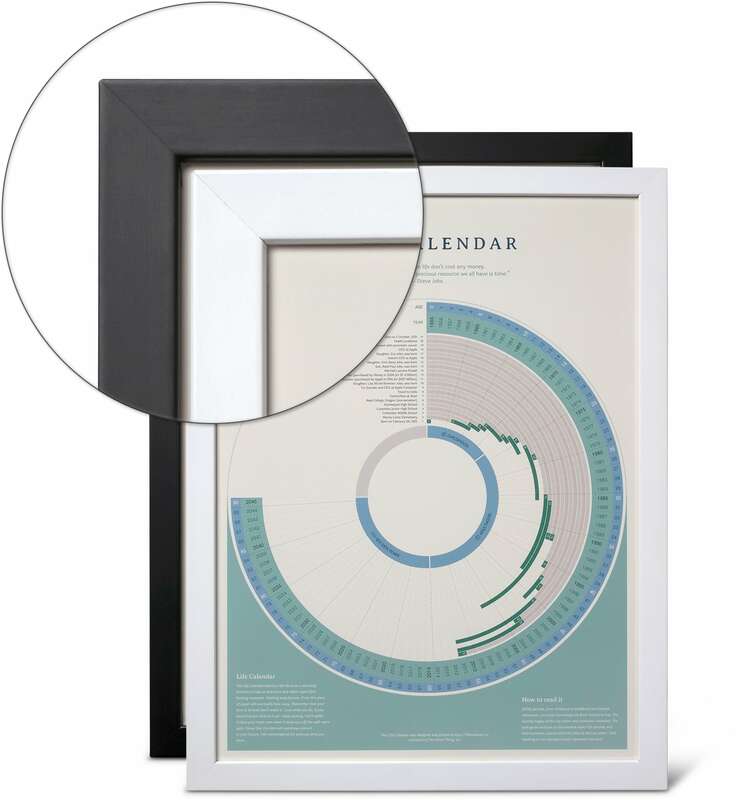 Stunning frame complements your Life Calendar with an elegant satin finish. High-quality wood strikes a perfect balance between light weight and lasting strength. Shatter-resistant Acrylic front protector makes poster colors even more vivid while keeping it safe. 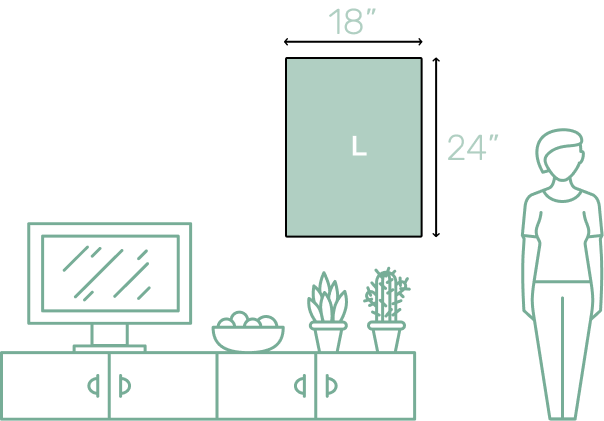 Built-in hanging hardware makes the hanging process almost effortless. 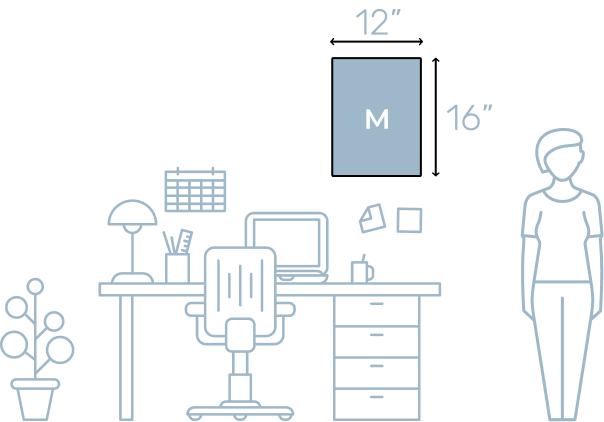 Choose the size that is right for you. Make your life story the heart of any room. Perfect dimensions for placing next to family photos or as a standalone piece at home or in the office. We've worked hard, and now we can make the shipping of your Life Calendar free. To any location in the world. For best protection, posters are meticulously wrapped and handled with care. And there is shipment tracking for every order. Every story is unique. See how others have harnessed their creativity to chart their personal journey. Inspire people all over the world by sharing your own. Post your photos on Instagram with the tag #lifecalendar. After all, beautiful stories are meant to be shared. 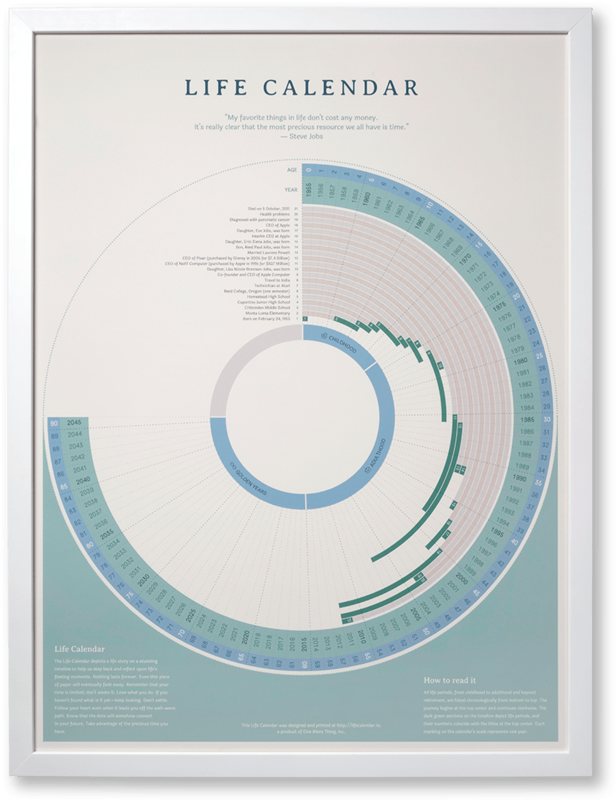 Life Calendar is a gorgeous poster that represents the important milestones and periods of your life as a chronological, graphical story. How to read the Life Calendar? All life periods, from childhood to adulthood and beyond retirement, are listed chronologically from bottom to top. The journey begins at the top center and continues clockwise. The dark green sections on the timeline depict life periods, and their numbers coincide with the titles at the top center. Each marking on the calendar’s scale represents one year. What kinds of life periods and events can I add? You can add anything that matters to you! Your grade school studies or higher education years. The day you met your life partner or your wedding day. The birth of your child. The first time you traveled abroad. Each of your cherished moments has a special place on your personalized work of art. Can I buy Life Calendar as a gift? Sure! And if you want to send it to an address that is different from your billing address, please contact us before you place the order. How many life periods and events should I add to Life Calendar? We suggest adding between 10 and 25 events. This is a perfect amount for telling your life story with Life Calendar. What poster sizes are available? 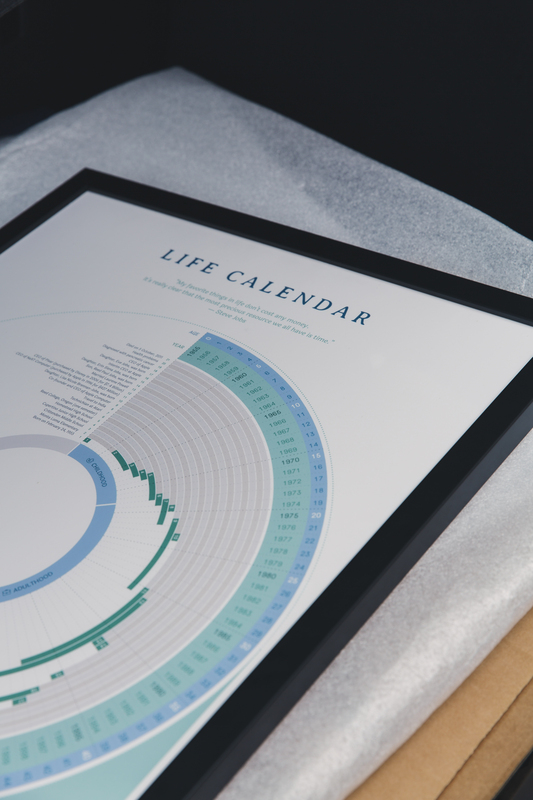 Life Calendar is available in two sizes: 16"×12" (31×41 cm) and 18"×24" (46×61 cm). What frame colors are available? The frame is available in two colors: black and white. The frame is made of high-quality solid wood. The poster is protected on the front with a shatter-resistant acrylic layer. How can I hang the poster? Life Calendar poster comes with built-in hanging hardware that makes the hanging process almost effortless. We accept Credit and Debit Card payments for Visa, MasterCard, American Express, Discover, Diners Club, and JCB. We use Stripe for accepting payments. Stripe is certified as a PCI Level 1 Service Provider - this is the most stringent level of certification available in the payments industry. We don't store any of your credit card details, either during or after the checkout. The general answer is - no. But if you contact us before the poster is printed, we will do our best to help. My billing and shipping addresses are not the same. What should I do? 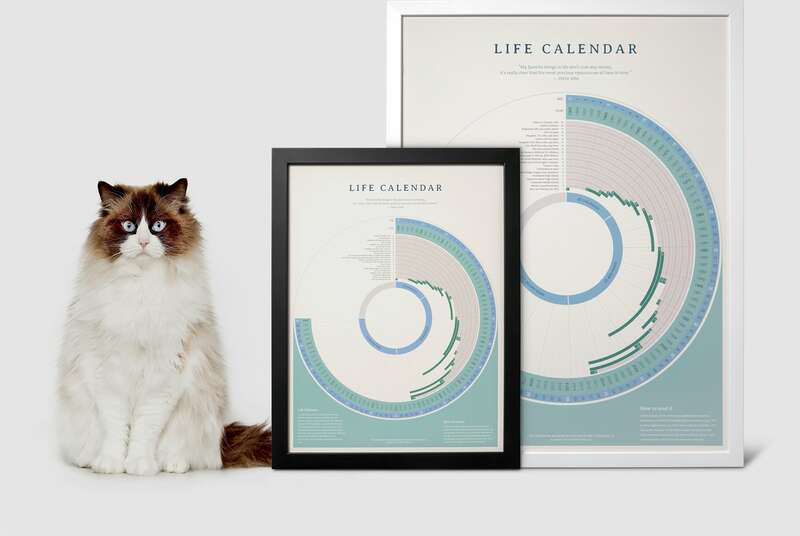 Please contact us at hello@lifecalendar.io before placing the order, and we'll help you out. What happens after the order is placed? Once the order is placed, we review the poster to provide the best experience for our customers, and we will make sure that you get the perfect Life Calendar. After the review, we charge your credit card, the poster is printed, packed, and shipped to you. Currently we are shipping to the U.S. only, but International shipping is our highest priority. Subscribe to our newsletter and we'll make sure to update you when Life Calendar is available in your country. How do I get the tracking number? Once the tracking number becomes available, you will receive an email with a link to a tracking page. How long are the shipping times? The orders are shipped in approximately 5 days, and shipping time to the U.S. is 1 to 5 working days. How is Life Calendar packed for shipping? Life Calendar is sent to you in a thick cardboard box. The frame is covered with corner protectors, and the whole poster is carefully wrapped in layers of high-quality bubble wrap. What happens if I made a mistake while filling out the shipping address? If this happens, please contact us as soon as possible. We will do our best to resolve this issue. However, if the order has already shipped, we will not be able to help. Our posters are produced in the UK and delivered internationally, and your order may or may not be subject to import duties and taxes applied to international orders. Please note that we have no control over these charges, and we cannot predict their amount. You will be responsible for payment of any such import duties and taxes. Please contact your local customs office for further information before placing your order. Can I return the Life Calendar poster? Customized items, such as personalized posters are not subject to returns and we don't have a process allowing us to accept returns. Something went wrong. Can I get a refund? Refunds are possible for cases when the product is lost during shipping, arrives damaged, or is not as ordered. Generally, as the first option, we will suggest reprinting and reshipping your order. Please see our policy for more details. We are happy to talk. If you have requests, ideas, questions that are not covered in our FAQ, or just want to share your experience with Life Calendar - send us an email! Subscribe to our newsletter to get occasional news and special offers. You will receive an order confirmation email including the receipt. Meanwhile, we are preparing your order for shipment! We encountered a problem with your order. We are very sorry, but an error occurred while we were trying to process your order. We have been notified of the problem, and we'll make sure to contact you if you are unable to proceed. Go back to the Checkout and make sure that you filled everything correctly.